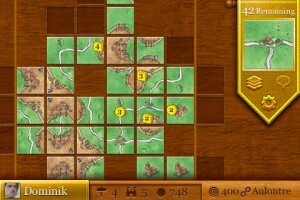 ‘Carcassonne’ Review — As Good As It Gets On The App Store? 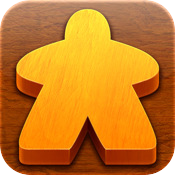 Admittedly, I have shied away from board games on the iPhone; very few of them offering the accessibility and multi-player fun of dusting off an old classic and sitting around a coffee table with friends. Even still, I had never heard of the award-winning German tile-based board game named after a world heritage listed French castle prior to our preview last month. But that’s all water under the bridge now, as Carcassonne [App Store] is definitely hot right now and set to rocket up the App Store charts. For those apparently hiding under the same rock as I have been; Carcassonne is a board game played with 71 tiles, artistically depicting fortified structures, fields, cloisters and roads (these being the key elements of the game). Tiles are randomly drawn and played on the table in turn by each player, of which there are up to 5 players at once, and placed next to each other so that each landmark aligns perfectly. Points are awarded by placing one of your limited tokens, your ‘Meeples’, on an element of the tile you’ve just played; be it road, structure or field. Points are scored both during the game and at the end, with completed city structures awarding bonus points. Carcassonne has undoubtedly raised the bar high for spit and polish. Every menu, game screen or tutorial is painted in gorgeous wooden hues as a tribute to its hand-crafted, table-top origins. The tutorials themselves comprise both fully-voiced demonstrations and a thoughtfully illustrated game manual which does wonders to explain the initially abstract scoring system. Carcassonne isn’t a difficult game to grasp, but it does have an extraordinary amount of depth. Advanced considerations such as where to play your farmer Meeples (which aren’t retrievable after placing them) so that they are in the largest field possible supplying the most completed structures (thus scoring points) will often prove the difference between a game otherwise left largely to luck of the draw. These strategies especially come to the fore in heated games of four or five players, where you have to contend with multiple playing personalities– be they aggressive players who will continually try to block or steal your developments, or the passive contender silently building a formidable point-massing fortress in a forgotten corner of the board. 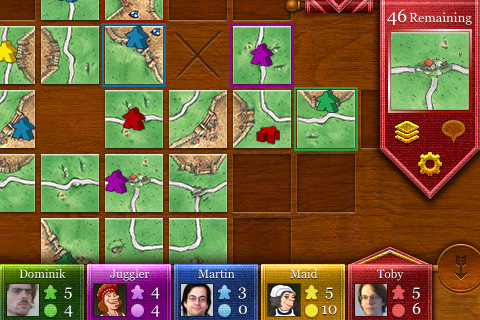 Carcassonne accommodates this fantastic multiplayer gameplay from every conceivable angle. Impressively, you can have a taste of multiplayer on your own, with a local mode able to add up to 4 computer-controlled opponents of 8 varying difficulty levels from easy to evil. The real fun though comes from matching wits (and trading blows) with real people. The aforementioned local mode also allows for 5 Pass-and-Play players to be added, or for WiFi or Bluetooth devices to join your game too. Internet games (over both 3G and WiFi) on the other hand can be quickly arranged between two people through the “Quick Game" option, where the game will search for an available contender. Fair warning though, these games are timed to keep the pace flowing, so leaving the game for prolonged periods will award the game to your opponent instead. The bulk of your multiplayer though will be spent by creating games with friends. Your friends list can be added to by having Carcassonne send an email link to friends, providing them with a link that when opened on their iPhones which appends you to their in-game friends list. Herein lies our only rub with Carcassonne. We’re not sure why the developers chose this method of connecting friends, as it forces you from the game for no justifiable reason and just feels clunky against the backdrop of an otherwise flawless interface. 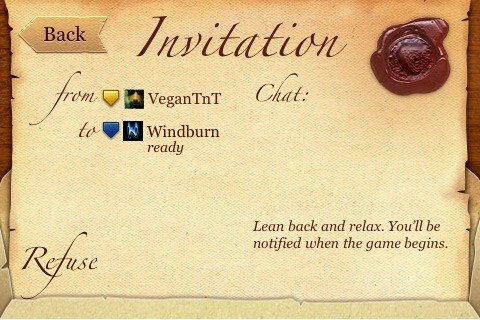 A system where you can invite and add friends from within the game would be far better, particularly for those who may not use the email application on their iOS devices. Internet games between friends are otherwise painless to setup, with a wax-sealed invitation received by all friends, after which they can opt to refuse the invite, or wait until the game leader commences the game. We say the bulk of multiplayer will be played like this, as utilising the friends list has a distinct advantage over quick play mode: gameplay becomes completely asynchronous and the quick game timer is dispensed with. The developers have also included ELO rankings for added bragging rights. Your ELO rating goes up and down when you win and lose internet matches, depending on the relative skill level of your opponent. It’s a terrific addition that is even further improved by the high score tables pitting your friends against each other. There is still one important gameplay mode to cover: the newly added Solitaire mode. Solitaire mode has a completely different scoring system, where you start off with 1000 points and each tile added reduces that score. The objective is to complete set targets which increasingly get harder as you complete them. You start the game having to build a 2-tile road and 2-tile structure, and as each is completed their tile number increases by 1. You are rewarded for keeping your playing field as compact as possible, with penalties imposed for expanding its borders. Every order of tiles in Solitaire is also recorded and fixed with a unique code (craftily, the name of the town), which you can share with your friends so they can attempt the exact same challenge. Unfortunately, friend challenges are processed via email, and though not a huge deal, does detract from the game’s magic (particularly as you have to remember your friends’ email addresses each time). 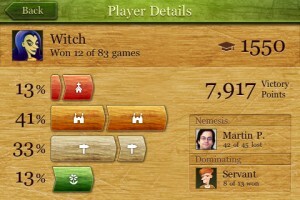 Carcassonne is a shining example of how to do a board game right on the iPhone. The developers have promised continued support which will see a universal iPad update coming later this year and In-App DLC for what we hope is most of the nearly 20 expansion packs available for the original game– some of which allegedly turn the gameplay on its head entirely. Carcassonne is wholeheartedly recommended to board game veterans and newcomers alike. Impressions are flowing in thick and fast from our forum readers, who also seem overwhelmingly enamored by Carcassonne. For iPad users, a free universal update will come later and it has been reported that Carcassonne in its current state scales extremely well.